I’ve decided to sell my workbook for the class called “Latest & Greatest AP Style for Tech PR.” This is a first for me, so I’d love some encouragement. I’d be so grateful if you could please share this info with your PR friends. 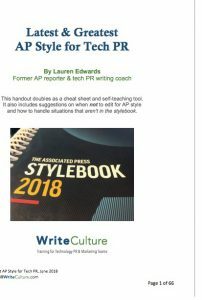 (1) I recently saw a big-name PR organization offer a webinar that included a conversation with an editor of the AP Stylebook. It was expensive and I doubted it would be anywhere near as efficient as my class, which is time-tested but updated — and customized for tech PR. (2) My workbook has matured so much that it can be used for solo study. You don’t need an instructor to use this book with complete and total success. I know this because I offer an AP style certification program to my clients. Highwire PR, a fast-growing agency now with offices nationwide, takes full advantage of this program. At this point, plenty of people have become certified in AP style after using the workbook on their own. And before that, earlier versions of this workbook helped hundreds of PR people. It used to be important that I lead people through the workbook because the pages weren’t self-explanatory. But now they are. I update my workbook every year, but over the last year, I made many more changes than usual — overhauling not just tweaking. 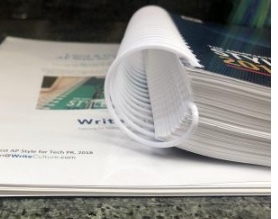 If you want to buy a spiral-bound copy of my workbook, please send an email to Info@WriteCulture.com. I’ll ask you to pay via PayPal or Venmo. A snail-mailed check works, too. The price is $159, which includes shipping and handling. I would feel safe charging $350 for my workbook because it’s really a full class. But I decided to go with the smaller amount because I want to make it easy for individuals whose employers don’t want to pay for their training. It’s reasonable that you wouldn’t want to risk $159 without knowing more, so more detail is below. It’s 66 pages, with info on both sides of the page. Items frequently missed by people who were doing their best are in red typeface, so you can give them extra focus. I call this standing on the shoulders of the generations before you. You get to benefit from their mistakes. The last page is a cheat sheet and table of contents. This gives you a one-page place to look for help when you’re on deadline. The cheat sheet is customized by you for you. The preceding pages are designed to show you what you didn’t know you didn’t know. Your notes from those sections of the workbook are to be transferred to the cheat sheet. Once you’ve personalized your cheat sheet, you’ll rarely need to open the workbook. I’ve put a clear plastic cover on the back, so you can see your cheat sheet (and the table of contents) without even opening the book. That said, you’ll probably want to look a few things up from time to time. This workbook is organized very differently from the A-to-Z AP Stylebook. For example, details you need for coverage reports are all on one page. Numerals (spell out or use figures?) are arranged in a visual format for easy reference, as well as explained. To get the sam e info from the AP Stylebook, you’d have to do a lot of reading and thinking. There’s a single page for digital terms (for tech PR), a single page for acronyms, and lists of words that are one word, two words or hyphenated. By contrast, the AP Stylebook is arranged in alphabetical order. I include topics that come up for PR but aren’t in the AP Stylebook, like double-datelines and trade-show datelines. There’s even an anecdote from my own experience as an AP reporter than explains how journalists determine bylines and datelines — it’s something that wouldn’t occur to a PR person. I offer advice on avoiding acronyms, with examples. I cover job titles in detail, with examples, since that obviously comes up a lot in PR. The workbook is broken into small sections — info, quiz, info, quiz, info quiz, plus other stuff. If you’re new to AP style, I recommend looking back at the info pages while doing the quizzes. In that case, the quizzes are for practice. 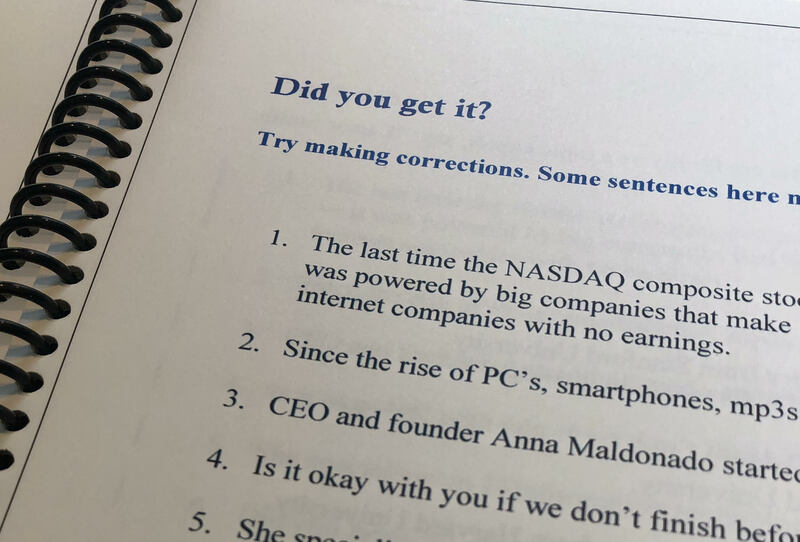 If you’re already really good at AP style, I recommend reviewing the info — especially the red typeface and visuals — and then taking the quiz as a little tiny test. The tiny test will show you what you didn’t know you didn’t know. It works as a filter that lets you eliminate noise while focusing on only what matters to your own growth. At the end, there’s a test called The Big Kahuna. After taking the quizzes, copying notes to the cheat sheet, memorizing your cheat sheet and reviewing the red typeface, you are ready for the big test. It’s another filter that shows you where you still need a little more focus. If you do well on that test (answers are included) and you want to become certified, that’s when you contact me. I customize your certification to make the best use of your time while making sure you will be justifiably confident and worthy of your team’s utmost trust. This workbook began as two stapled pages. It grew to eight stapled pages, and I worried it was too long. But apparently it wasn’t. People thanked me. They asked me for practice quizzes. I kept making new ones, as more people requested more of them. All of these requesters worked in tech PR, so all of the explanations and quizzes were designed for tech PR. The Associated Press also offers quizzes. I bought them one year and found them valuable for journalists but not PR people. They include too much that will never or almost never come up in tech PR work. Using the AP’s own quizzes, you’d expend extra time and effort that wouldn’t apply to your job. If you are still reading this, you can see now why the big PR organization’s offer of an expensive webinar got me thinking. I feel certain my program is more comprehensive and efficient, and now I’ve priced it for self-motivated individuals in search of justifiable confidence. Most of you reading this blog know a little about me. But if you don’t, or if you need a refresher, I have been a tech PR writing coach since 2000. I was a journalist with the AP in Fresno, San Francisco and Tokyo. I taught myself AP style by reading the entire stylebook for 15 minutes each morning — I set my kitchen timer — before I even began at the AP. I was surprised when a tech PR agency — A&R Partners — asked me to teach AP style. I didn’t think it was something to be taught. Like most journalists, I had taught myself. But I obliged. I began giving little mini lessons, starting with trending errors in their PR work. My special knack is being inside other people’s heads with them, when they let me. This gives me insight about their strengths, learning styles, stumbling blocks and gaps. I adapt to learners. This is why I’m such an efficient instructor and coach. In annual reviews when I was still a reporter at the AP, we took a style test. It wasn’t about knowing stuff; it was about how to find the hard-to-find stuff. Sometimes, you have to look in several places and cross-compare before getting what you need. I took pride in being able to do that. But when I created materials for tech PR people, I aimed to eliminate the searching and cross-referencing. Time passed and my AP style classes remained perennially popular. The body of work grew and evolved. The certification program came along because I was tired of talking about AP style and wanted others to become the go-to people. As my certified group got smarter and smarter, their questions of me became more interesting and difficult, so I became smarter, too, thanks to them. I now know more than I knew as a reporter. My most recent overhaul of the workbook — earlier this month — was my biggest ever. I feel really proud and confident offering this to you now. The workbook all but replaces the AP Stylebook, for most teams most of the time. That said, I also encourage teams to buy a new edition of the AP Stylebook for their in-house go-to people. I recommend making the AP’s book one of the “prizes” for getting AP certified through me. Not because it’s right or best. It’s neither of those. It’s time-honored and increasingly used by more industries. Having one standard makes it easy for people who work in teams across geographies to edit and write efficiently on deadline. AP style builds PR’s credibility with journalists. When you do things right — the journalist’s version of right — journalists won’t notice. But if you do things wrong, that’s noticeable. It’s like a clean or dirty house. You don’t think about whether a clean house is clean; you just enjoy the space. But if it’s dirty, you are distracted and may feel uncomfortable. PR people are automatically outsiders. Journalists keep their guards up when they talk with you. Reminding them of your outsider status by failing to write in correct AP style calls attention to your outsider status. Some companies diverge from AP style. Personally, I don’t think the style details themselves are what matters. What matters to me is consistency and speed on deadline. Sticking with a time-honored standard that’s everywhere is a better use of everyone’s time. During the dot-com bubble, Wired magazine tried to promote its own stylebook, as did other companies. But none of the disrupters gained ground. Even as newspapers closed or laid off staff, AP style gained new converts. I don’t teach AP style because it’s best or better; it’s just the industry standard. This is one of the few ways in life you can buy justifiable confidence. If you complete this book as designed, you will be deserving of trust. Thanks for reading all the way to the bottom! Please send a note to Info@WriteCulture.com and say which form of payment you prefer (PayPal, Venmo or snail-mailed check) and the address where your workbook(s) should be mailed. Please do share this offer with friends, especially before July 16. Thanks for your support and encouragement! If you want to train a whole team, not just yourself, please order one copy per person. The book is interactive and results in a customized cheat sheet for each user, so you’ll want everyone to have their own. Journalists hate acronyms: How to avoid ‘alphabet soup’ Is corporate storytelling an oxymoron?